S3I-201 shows potent inhibition of STAT3 DNA-binding activity with IC50 of 86 μM in cell-free assays, and low activity towards STAT1 and STAT5. On day 1, 5-week-old female NOD/SCID mice were injected with 1 x 108 cells of the NOD/SCID repopulating T315I BCR-ABL1-positive leukemia UPN1 cells. On day 2, these mice were treated with either vehicle (n = 6), vismodegib (20 mg/kg per os; q.d. ; n = 6), ponatinib (30 mg/kg; q.d. ; n = 6), vismodegib (20 mg/kg per os; q.d.) + ponatinib (30 mg/kg; q.d. ; n = 6) for each group. On day 28, mice were sacrificed for evaluation. CD19-positive cells from peripheral blood from each mouse have been shown. Histopathologic analysis of the bone marrow cavity from each treated mouse with UPN1 transplantation. Similar results were obtained in 2 independent experiments. H&E, hematoxylin and eosin. Fludarabine is a STAT1 activation inhibitor which causes a specific depletion of STAT1 protein (and mRNA) but not of other STATs. Also a DNA synthesis inhibitor in vascular smooth muscle cells. Stattic, the first nonpeptidic small molecule, potently inhibits STAT3 activation and nuclear translocation with IC50 of 5.1 μM in cell-free assays, highly selectivity over STAT1. 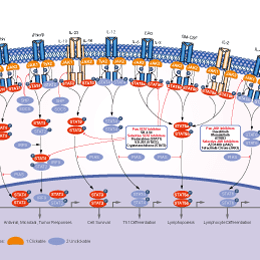 The cell viability was determined in HEC-1B cells treated with MPA, insulin, GSK1904529A or Stattic or with silenced DHCR24. Niclosamide can inhibit DNA replication and inhibit STAT3 with IC50 of 0.7 μM in a cell-free assay. Niclosamide selectively inhibited the phosphorylation of STAT3 and had no obvious inhibition against the activation of other homologues (e.g., STAT1 and STAT5). Bacterial infection in IPEC-J2 cells. The invasion and attachment of EHECO157:H7 was increased in the IPEC-J2 cells in the presence of 1 μM niclosamide. Data are expressed as the mean ± SEM (n= 6). Differences between groups were determined by paired samples t-test. *P<0.05 compared with the control. Nifuroxazide is a cell-permeable and orally available nitrofuran-based antidiarrheal agent that effectively suppresses the activation of cellular STAT1/3/5 transcription activity with IC50 of 3 μM against IL-6-induced STAT3 activation in U3A cells. (A) and (B) NSCs were transfected with vector or shRNA against miR-200a, and then the miR-200a-silenced cells were treated with or without Nifuroxazide. p-STAT1, STAT1, p-STAT3, STAT3 and c-Myc expression levels were determined by Western blotting. AS1517499 is a novel and potent STAT6 inhibitor with an IC50 value of 21 nM. Expression of indicated proteins in PRL-stimulated INS-1 cells without (control, white bars) or with (black bars) STAT inhibitor (SH-4-54). Napabucasin is an orally available Stat3 and cancer cell stemness inhibitor. Artesunate is a part of the artemisinin group of agents with an IC50 of < 5 μM for small cell lung carcinoma cell line H69. It is a potential inhibitor of STAT-3 and exhibits selective cytotoxicity of cancer cells over normal cells in vitro; A potent inhibitor of EXP1. BP-1-102 is a potent, orally bioavailable and selective STAT3 inhibitor, binds Stat3 with an affinity Kd of 504 nM and blocks Stat3-phospho-tyrosine (pTyr) peptide interactions and Stat3 activation at 4-6.8 μM. WT and 4E-BP1/2 DKO cells were treated for 4 h with 10 ng/ml LPS with or without 2 μM BP-1-102 (A) and relative amounts of Nfil3 and sIl1ra mRNAs were quantified using RT-qPCR (normalized to Rpl19). Cryptotanshinone is a STAT3 inhibitor with IC50 of 4.6 μM in a cell-free assay, strongly inhibits phosphorylation of STAT3 Tyr705, with a small effect on STAT3 Ser727, but none against STAT1 nor STAT5. (a) Effect on STAT3 DNA binding activity of the STAT3 inhibitors cryptotanshinone (CTN) and S31-201 in STAT3 mutant cell lines OCI-Ly12 and OCI-Ly13.2. (b) Effect on cell viability at 48 h of the STAT3 inhibitors cryptotanshinone and S31-201 in OCI-Ly12 and OCI-Ly13.2 cells. SH5-07 is a robust hydroxamic acid-based STAT3 inhibitor, which induce antitumor cell effects in vitro and antitumor response in vivo against human glioma and breast cancer models. Ochromycinone (STA-21) is a selective STAT3 inhibitor. HJC0152 is a signal transducer and activator of transcription 3 (STAT3) inhibitor with remarkably improved aqueous solubility. APTSTAT3-9R is a specific STAT3-binding peptide with addition of a cell-penetrating motif. The treatment of APTSTAT3-9R in various types of cancer cells blocks STAT3 phosphorylation and reduces expression of STAT targets. C188-9 is a potent inhibitor of STAT3 that binds to STAT3 with high affinity (KD=4.7±0.4 nM). C188-9 is well tolerated in mice, shows good oral bioavailability, and is concentrated in tumors. HO-3867, an analog of curcumin, is a selective STAT3 inhibitor that inhibits its phosphorylation, transcription, and DNA binding without affecting the expression of other active STATs. Cell apoptosis as measured by TUNEL. Representative sections as determined at 12 hours after reperfusion (3100 magnification). Apoptotic nuclei were stained red, and the software of Image J was used to analyse quantity of TUNEL-positive cells in the livers. Scale bars5100 lm. *P<0.05, **P<0.01, ***P<0.001 compared with IR group.